A bit of travel is always necessary for a happy life, to broaden one's horizons. But did you know that people will truly travel all the way across the world to get to parts of New Zealand, known as truly world-class for their seafood, wine and scenery, which we simply forget are there? 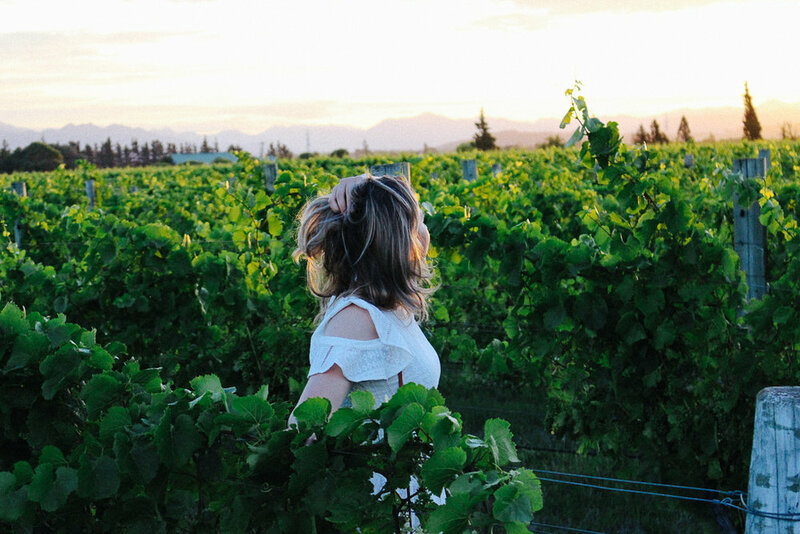 Marlborough, home of some the most beautiful wineries in the world, is such a place. Then came my favourite part of the trip - our stay at Vintners Hotel Marlborough. This place is insanely beautiful and you are literally staying IN the vines of a winery. We ran around the room, so excited to be there, and Matt promptly plonked himself in front of the TV watching Sky Sport while I pottered, did a face mask and put away all our clothes and possessions like it was our home. Did I secretly want to move in? You bet I did. The following day, we did a fabulous wine tour with Wine Tours by Bike. This was such a great way to explore the wineries and Steve, our host, was just the bee's knees. These guys had everything from maps to helmets sorted. Although we only made it to five wineries, Forrest, Framingham, Nautilus, Cloudy Bay (which I’ve wanted to visit for years! ), Wairau and Bladen, Steve told us that that was pretty standard. We bought five bottles of wine, from Bladen, Framingham and Nautilus Wineries which is a great way to kick-start a wine collection. Matt and I agreed we’re going to try and appreciate when we drink wine more and do our research instead of choosing what is on sale at New Work going forward. I crashed after the delicious burger at Wairau River Wines (oh boy, that burger - the coconut yoghurt in it was heaven), having too much food and alcohol in my body at once, but then pepped up enough to cycle home. We finished up the tour, before heading home, and going to The Good Home in Blenheim for dinner (eating more fish and chips and burgers - I promise, my diet starts tomorrow!). Shout out to Hayley, the manager for taking us under her wing when we were late to arrive. After our fascinating tour, it was time for lunch and we opted to go to Terravin Winery. The food here was absolutely to die for. We only regret we couldn’t order everything on the menu! We did try the goat's cheese, popcorn chicken, salmon and some iconic Marlborough oysters (which were probably the best I’d ever had). I couldn’t recommend coming here enough and if we come back, we will certainly be ordering the platter, pictured below. Sign up with your email address to receive a newsletter from the coolest blog in the coolest little capital, full of tips of where to eat, what to see, where to go and what to read. Delivered the first of each month.